Long ago one of the mightiest living creatures, the feared Dragon has become only bones and dark sinew. Long after its death, it was raised through the dark powers of necromancy, which it now serves. 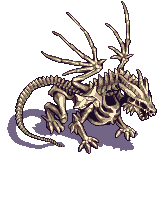 The Skeletal Dragon may look like nothing more than a pile of bones, but few people who thought that way lived long enough to change their minds. Last updated on Sat Apr 20 01:38:29 2019.